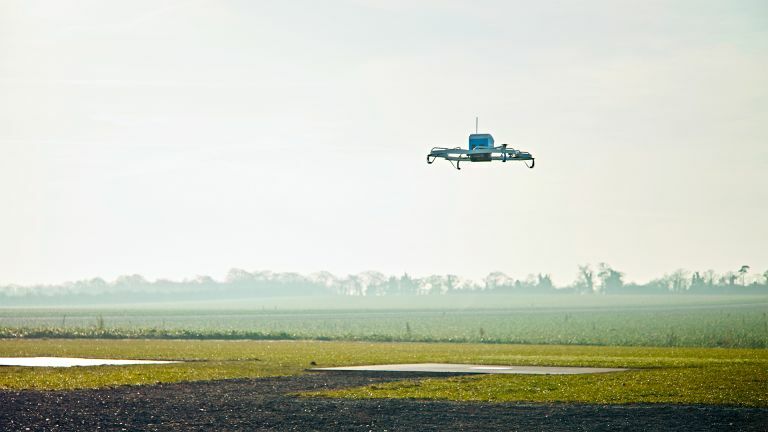 Amazon drone delivery is a reality and has begun in the UK for real. A customer in Cambridge was the first to receive an order via the robotic air service from Amazon Prime Air. The move comes after UK legislation ruled to approve use of the flying drones as a means of quickly delivering items for Amazon. This trial restricts item weight to 2.2kg on a drone flying at under 400 feet. This was enough for its first delivery of an Amazon Fire TV and a bag of popcorn which took 13 minutes to drop-off. That’s good since the drone’s delivery time appears to be within 30-minutes or less. The trail is currently limited to within a 5-mile radius of the Cambridge Amazon warehouse. It requires customers to print off a QR code and place that on the ground outside their house so the drone can home in on it like a beacon. Amazon is also testing its Prime Air delivery services in the US, Austria and Israel but since the UK was first to legislate, its trials will progress more rapidly. More Amazon Prime Air deliveries will be taking place in the UK where lots of data will be collected to help better inform future deliveries. The drones are highly autonomous and one test is to see if a single human can oversee many deliveries taking place at once. Since the drones dodge obstacles, the idea is that they’ll eventually be good enough to operate in all different areas, perhaps even busy cities.